Sport relies on volunteers to spread their knowledge and passion to communities. They are the parents, teachers, family members and community that bring their excitement onto the field. Let’s Swim, funded by the Pacific Sports Partnership under the Australia Government, relies on a network of volunteers to bring water safety and learn to swim to the communities and those who need it most. This week we celebrate those people and their stories. Today, we highlight the impact respected professionals from Australian swimming organisations have had on swimming programs and the role they have played in building the capacity of swim instructors and coaches over the past 5 years throughout Oceania. The Let’s Swim curriculum was developed in consultation with highly respected people in the Australian swim industry. Julie and Deny Zancanaro and Nicole Dodds from Hills Swimming and Haydn Belshaw from Aquabliss formed the Technical Working Group for Let’s Swim, donating their time each quarter to flip through pages of resources and submit pages of notes. However, that is not all that they donated. Both the Hills Swimming team and Haydn have given years of hands on assistance in the Pacific Islands. They have run Swim Australia courses, CPR classes and mentored coaches and swimmers across the region. Haydn first came to work in the Pacific Islands in February of 2014 when Fiji Swimming was looking for an accredited course presenter to deliver the Swim Australia Teachers (SAT) course. “We chose him because we liked his name,” joked Trisa Cheer, the Fiji Swimming Program Coordinator. Five years later Haydn is still actively involved in Fiji Swimming, returning every year to train more swim instructors, coaches and even the swimmers. He’s helped train high performance swimmers all the way down to infants. “My favourite part of coming to Fiji is working with the people of Fiji. The passion, and how extremely nice they are,” said Haydn. During his trips, he makes the most of his time running multiple courses if needed. On his most recent trip this year, Haydn ran three courses in just under a week! Since his introduction to the Pacific in 2014, he’s volunteered his time in Tonga, Solomon Islands, Brunei and was a speaker at the recent FINA Swimming for All conference in Thailand. He does all this volunteering in his spare time, aside from being the Aquatic Director at Barker College, Head Swim Coach with Newport Kinghorn Surf Racing Academy, serving on the Board of Directions for Coach Accreditation on Swimming Australia and the Board of Directors for ASCTA NSW. It was at an ASCTA conference where Haydn introduced Julie to the idea of working in the Pacific. 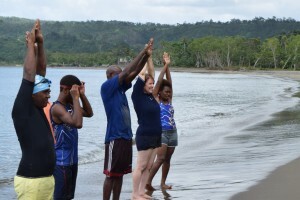 In 2015, Julie and her husband Deny contacted Vanuatu Aquatics Federation (VAF) and offered up their services as course presenters. Julie came to the team with a list of accomplishments, as the managing director of Hills Swimming and on the board of the International Swim School Association. She was even inducted into the International Swimming Hall of Fame earlier this year. Julie and Deny arrived right before Cyclone Pam hit, departing a day before the winds hit Efate island. However, from a distance they provided both emotional and technical support in the weeks and months after the Category 5 storm demolished the island. They returned later that year with their staff member, Nicole Dodds, to run an even bigger training with 20 school teachers from around the island. Nicole has since become deeply involved in reviewing the Let’s Swim teacher training program, volunteering time each week to look through materials. They fell in love with the country and the swimming program, and funded a professional development trip for a VAF coach and two swimmers to train at their facility in New South Wales for a week. For Julie, the passion for the Vanuatu swimming project has filtered down to her team of staff, many of whom she has brought across to Port Vila every year when she and Deny volunteer their time with the Vanuatu team. In a sporting environment that focuses on high performance, it can be easy to forget how important sport for development matters. It is swim teachers like Julie, Deny, Haydn and Nicole that make working in a low resource area a bit easier. The tiny islands of the Pacific are isolated from the rest of the world, but help from volunteers like these, makes the distance feel a little shorter and brings quality education right to our tropical shores.